With the last week of camp upon us, most of my neighborhood is gearing up for vacation. This place turn into a ghost town in mid August. For our family, that means one thing: camping! Now, before you write me off as once again up to my granola antics, hear me out. 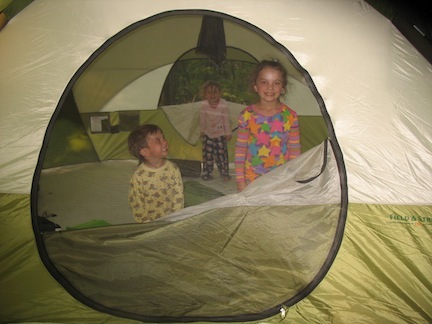 While camping may not be for everyone, it offers a great family vacation for many. Especially us. IT’S CHEAP! Subtract the food from the cost of our vacation (we’d have to eat at home, right? ), and a week-long camping trip costs $250 max. GREAT FOOD: Camping is the best way for a kosher diner to eat in style on a vacation that is not near kosher restaurants. We use a propane stove and grill to make pancakes for breakfast, pasta and sandwiches for lunch and every grilled thing you can imagine for dinner. We bring the cheese and meat products from Chicago and buy the rest at local groceries. S’MORES BY THE CAMPFIRE: Enough said. EVERYBODY HELPS: There is no other time besides our camping trips that my kids so willingly help (and on the first time that I ask them, no less!). You’d have to try it to believe it, but my otherwise unmotivated “helpers” are suddenly putting up the tent, making dinner, gathering kindling for the fire and helping with the younger kids. FREEDOM: There’s no schedule and nowhere we have to be. The kids bike and swim all day, and then crash at night when it’s dark. WIDE OPEN SPACE: Whether it’s space to think, roam or breath, camping offers them all. Whether or not you’re brave enough to try camping, Door County is a fabulous vacation spot for everyone. Under 5 hours to the north, Door County features the charm of Cape Cod. Tiny towns dot the peninsula on Lake Michigan, so that almost every area is on the water. Each year we head there for a relaxing week of biking (they rent all kinds there), boating, swimming and hiking.